The Java max Function is one of the Java Math Library function which is used to return the Maximum or Largest value from the given two arguments. In this article we will show you, How to use Math.max function in Java Programming language with example. If the argument are either positive integers or Negative integers, Math.max function will return the Output. and, if the arguments are not a number, Math.max function will return NaN. Java Programming provides four different Math.max Java functions to find the Maximum or Largest value from the given two arguments. Following function will accept positive or negative integer value as first and second argument and returns the Largest value of integer type. Following function will accept positive or negative double value as first and second argument and returns the Largest value of double type. The following Java max function will accept positive or negative float value as first and second argument and returns the Largest value of float type. Below Java max function will accept positive or negative long value as first and second argument and returns the Largest value of Long type. First, We declared variables of type Double, Float and Long to display the functionality of java Math.max function on different data types. 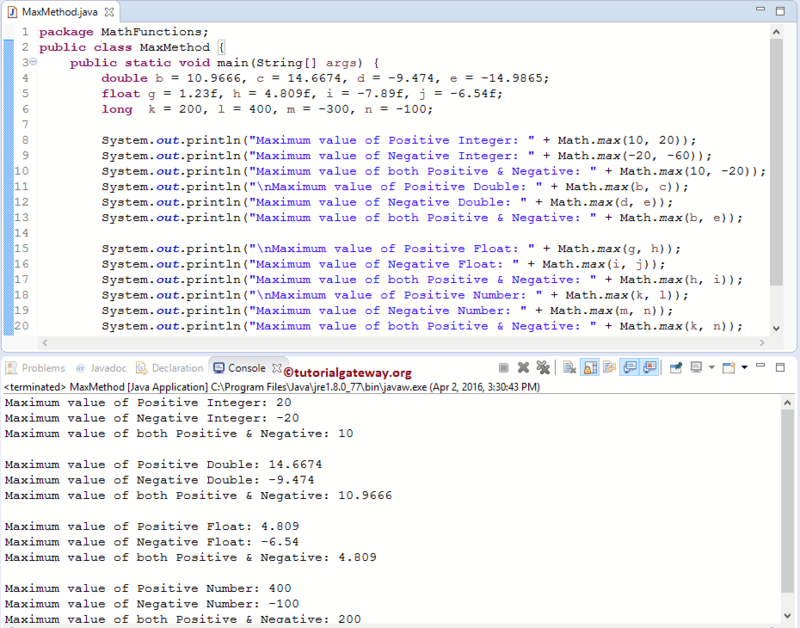 Next, We used the Java Math.max Function directly on both the Positive integer and negative integer values. Following statements will call the max method of integer type ( static int max(integer a, integer b) ) and find the largest among the values. Here, We used the Java Math.max Function on variable b, c, d and e (they belongs to double type). Following statements will call the max method of double type ( static double max(double a, double b) ) and find the largest among the values. Next, We used the Math.max Function on variable g, h, i and j (they belongs to float type). Following statements will call the max method of float type ( static float max(float a, float b) ) and find the largest among the values. Last, We used the Math.max Function on variable k, l, m and n (they belongs to long type). Following statements will call the Java max function of long type ( static long max(long a, long b) ) and find the largest among the values.